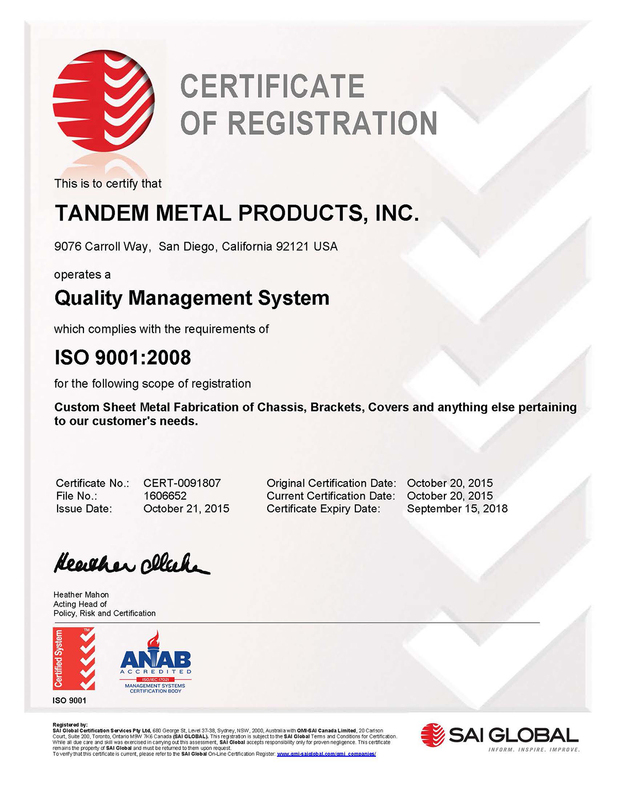 Tandem Metal Products Inc. is a full service sheet metal fabricating facility using top of the line equipment including Amada, Timesavers and Haegar. Our experience, efficiency and equipment ensure that critical specifications are met. You can count on consistent quality as well as on time delivery. TMP tracks projects from estimate through production, documenting your jobs for future reference. Your finished products are thoroughly inspected and must meet your print specifications as well as our stringent standards. Need an estimate today or tomorrow? We can accomodate your tight schedule, because we realize that time is money with today's dynamic markets. We can give you prompt answers to your questions while you're in production. Tandem Metal Products puts the latest software to work for you. We upgrade annually to ensure that you benefit from the latest pre-production design. We run the top-rated programs, including Solid Works, the leading mainstream CAD system with multiple design alternatives and enhanced product quality; Amada AP100, an advanced CAD/CAM system capable of generating code for punching and cutting machines; Pro/E, DXF, and IGES. We house multiple programming stations and dedicated computers for greater flexibility and rapid turnaround. We provide quality pre-production prototypes for our clients, working from blueprints, drawings, or even completed parts which you wish to replicate precisely or with specified modifications. Fill out our contact form to get in touch with one of our representatives, please make sure to include details about your project.